“Brown Is Bad, Brown Is Cell Death.” The “brown” is tau, a protein that accumulates in the brains of people, like professional football players and boxers, who have sustained repeat blows to the head. Learn about the research and education going on at the Center for the Study of Traumatic Encephalopathy, a collaboration between Boston University School of Medicine and the Sports Legacy Institute. 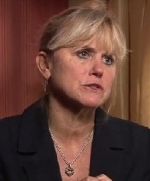 See all videos interviews with Dr. Ann McKee. Posted on BrainLine December 1, 2010. Center for the Study of Traumatic Encephalopathy at Boston University. Used with permission. Third-party use restricted. www.bu.edu/cste.